We all know our own dogs. 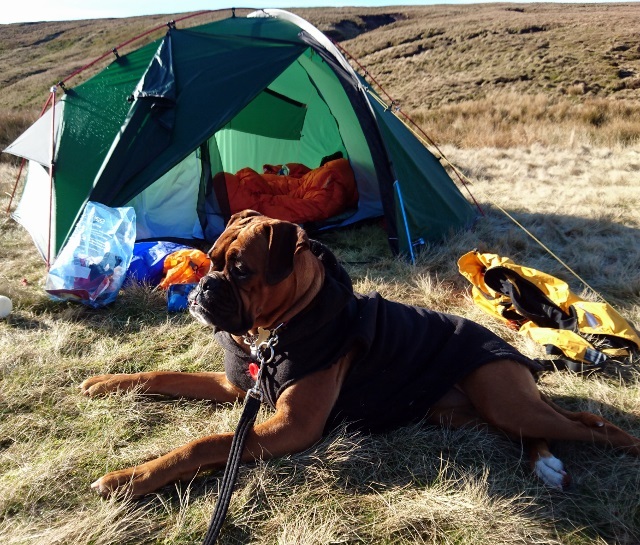 Some have thick fur, some thin, some love wild weather, some hate the rain, and some even love wild camping with us. 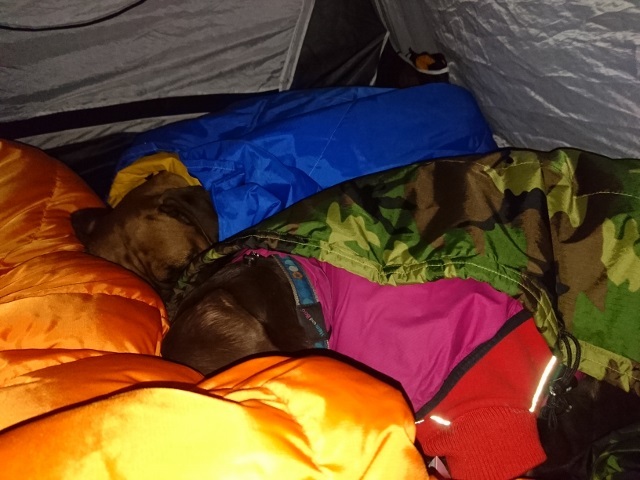 Camping with both Dixie and Tilly, we tried all sorts to keep them comfy. 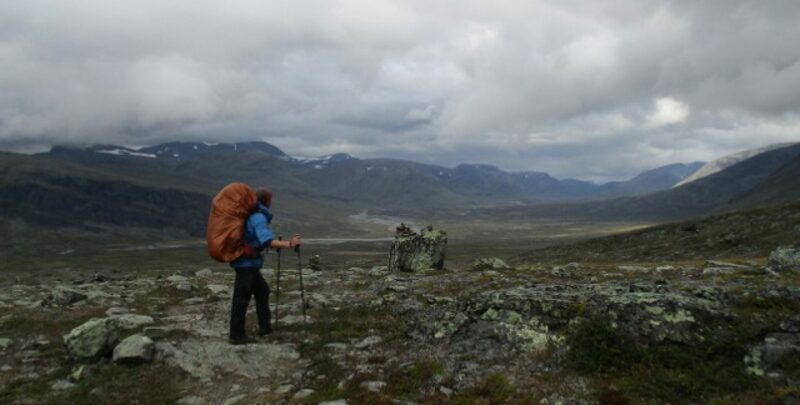 The summer’s not so hard, but in the cold it can be very challenging. Blankets, fleece coats, insulated coats, foam mats – they’ve all been tried, in every combination possible. Nothing ever seemed either just right or straightforward, however. 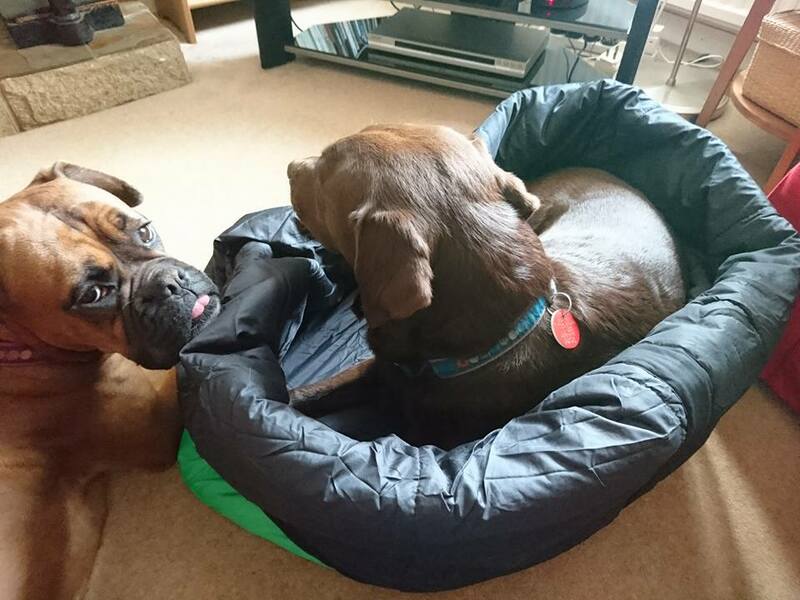 But since Pebbles and Islay have been on the scene, we’ve discovered some doggy sleeping bags. On sale in the States (although they have recently stopped shipping to the UK) and rather expensive, we nevertheless invested in some. They’ve been quite a success. 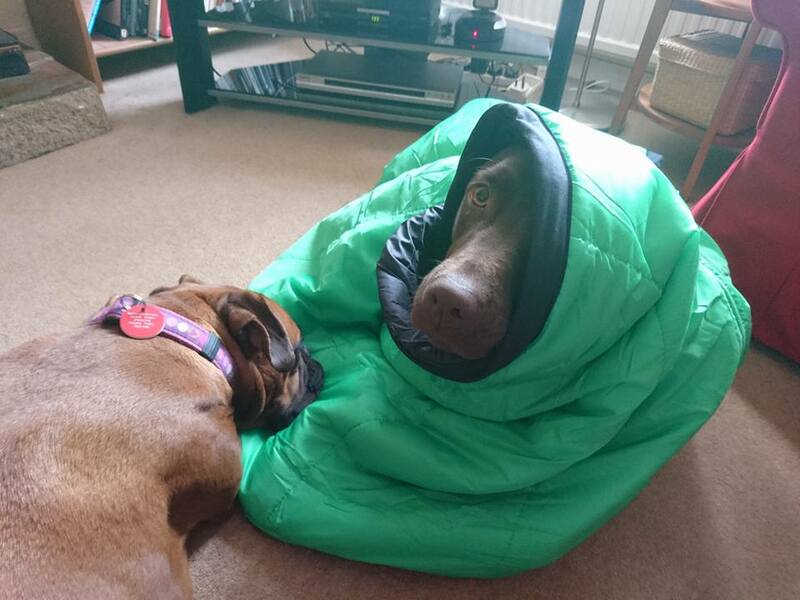 If it’s hot, the dogs don’t have to be fully covered, but if it’s cold, they can be. We’ve never found the need to carry a foam mat for them anymore either. The insulation in the bed seems adequate on its own. 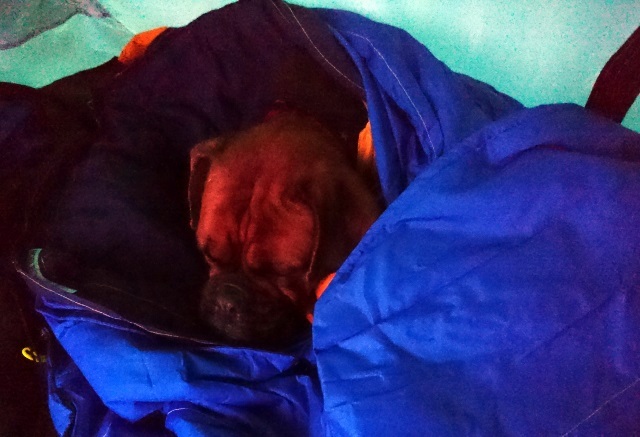 Pebbles was even toasty warm one night when it was -5C outside. To complement the bags, they also have summer weight fleecey PJs and winter weight fleecey PJs. 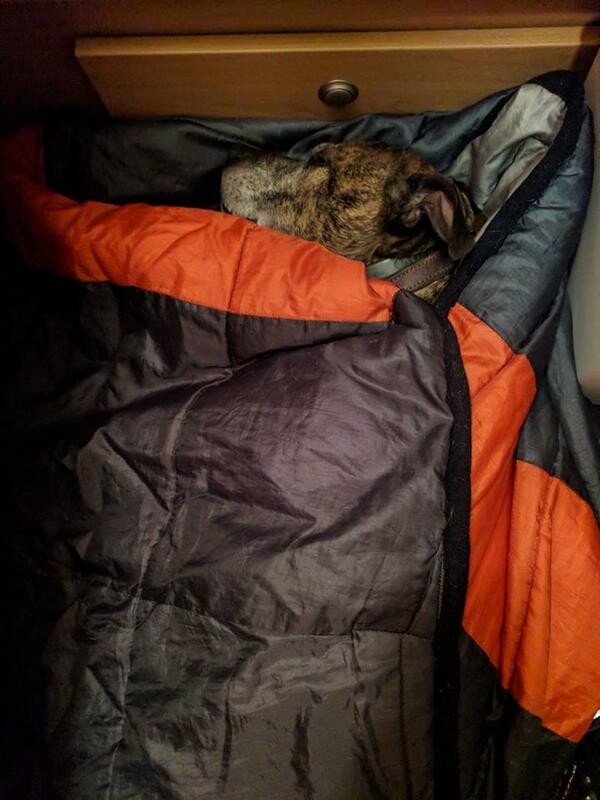 If Pebbles is fidgety overnight it is possible for her to get uncovered and I sometimes wake up when she moves and have to re-cover her, but this is only really an issue if it’s very cold. And I have noticed that on the whole, the colder it is, the less she fidgets. One of the reasons it’s good for her to have winter PJs on anyway. Not long ago, my mate James wondered if I might be able to make one of these bags myself, for Reuben to use. It was a challenge I rather enjoyed. It would appear that Reuben has also been pleased with the results. 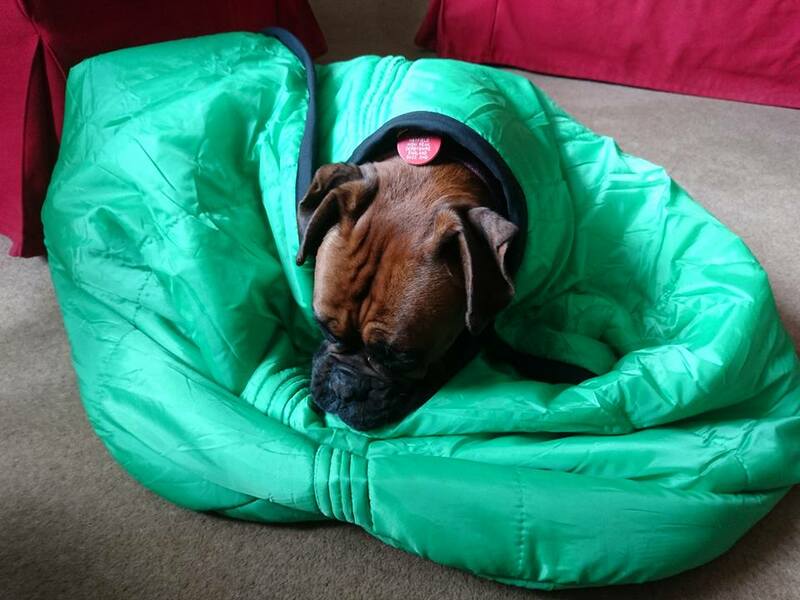 There has been a fair amount of interest recently in my version of the Doggy Sleeping Bag, culminating in me making some more. 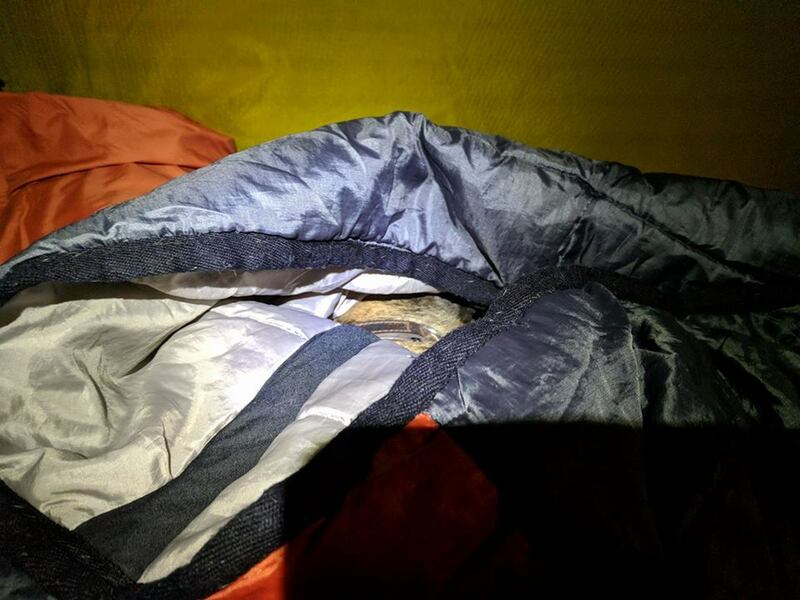 They function rather like a cross between a soft bed and a sleeping bag. In soft bed form, with the sides folded down, they can simply be sat or laid in. 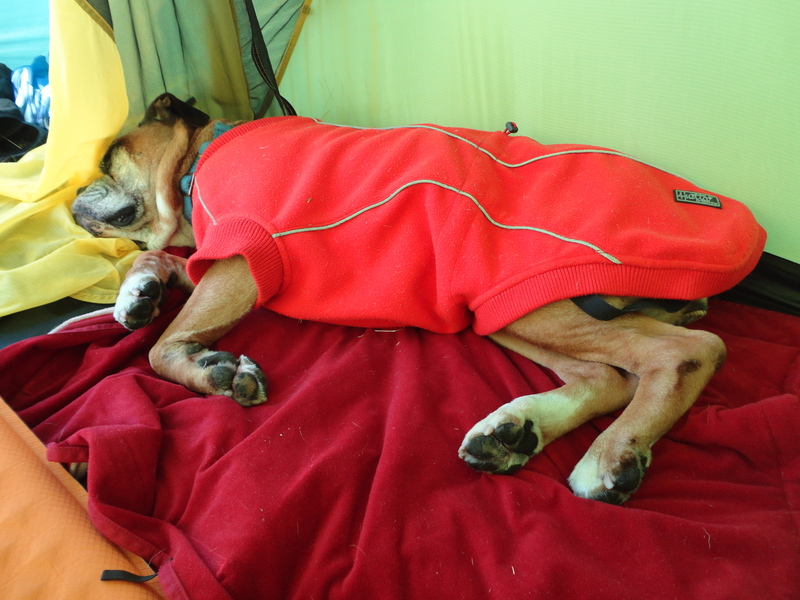 But if you want the dog covered, you simply have to unroll the tall sides and lay them/wrap them over your snoozing canine. 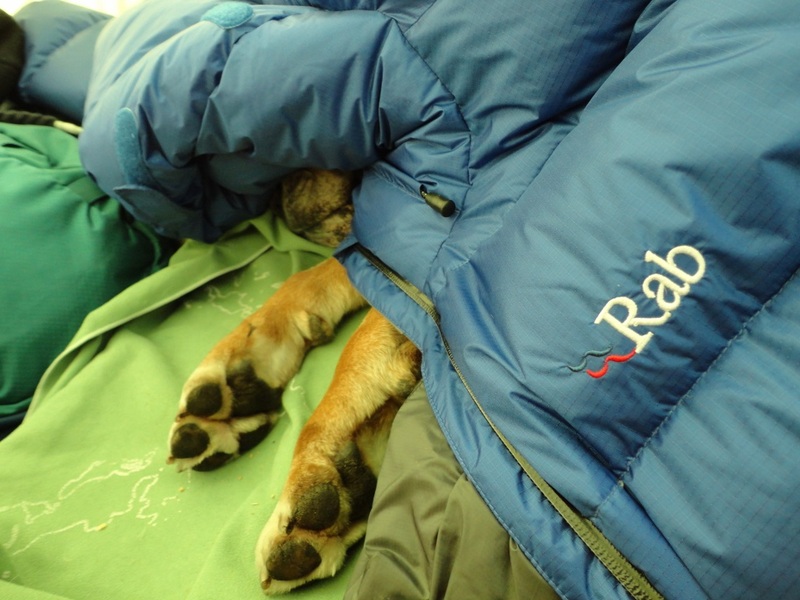 Of course, if your dog sometimes prefers to sleep on its side, the bag can also be turned on its side – more like a human sleeping bag – and be used that way. In fact to be honest, it doesn’t really matter how you wrap them up, as long as they’re happy! I certainly don’t have any grand ideas about becoming some kind of huge enterprise here, but if anyone reading this is interested in one or simply has any queries about them, please don’t hesitate to get in touch. 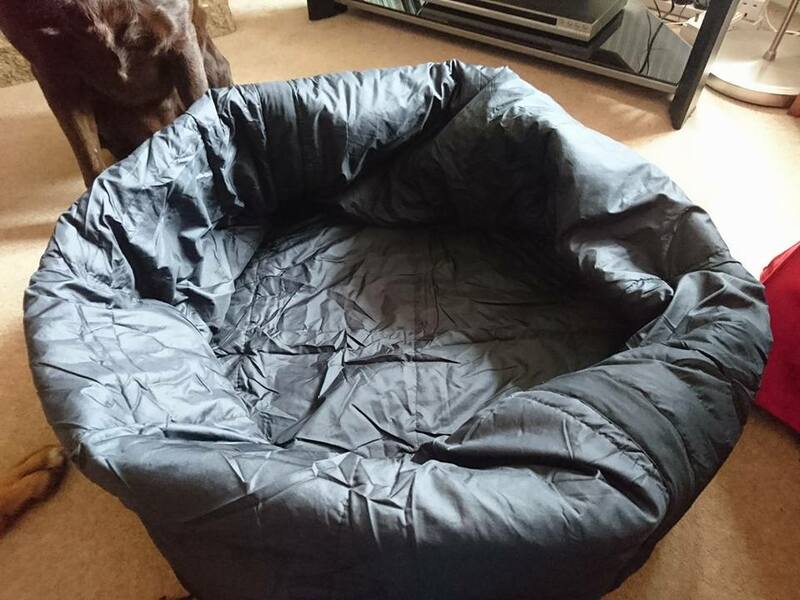 The medium sized bag that I’ve made most of (shown in these photos), has a base with a diameter of 27″ and seems to suit most average sized dogs. It weighs approximately 750g to 800g – being all handmade they can differ slightly – and will pack into a compression sack quite well. I have also made smaller ones at 23″ diameter (approx. 450g – 500g) for terrier sized pooches, as well as a couple of larger ones – a 30″ one which weighed approximately 950g, and a 32″ one which was about 1100g. Believe me, the 32″ was very large once finished, and I don’t think me and my domestic sewing machine could handle making anything larger than that. All the bags I make have synthetic insulation – I don’t really see down as being a viable option for potentially muddy, wet canines! I am currently charging £70 for a 27″ or smaller sized bag – I make them using the material from a ‘human’ sleeping bag, so have to buy the same donor bag whether I make a small or a medium – but a larger one (ie bigger than 27″) would cost £95, as I’d need to buy two donor bags to use. The best way to decide which size bag you might want, is to contact me and we can discuss the size of the dog/how it likes to sleep etc. I can be contacted via my email at chrissie.cleo@btinternet.com or via Messenger on Facebook (Chrissie Crowther). Thanks Lizzi, although of course my inspiration was the ones we’d initially bought from the States. Works very well though! Hi. Great idea. Do you custom make these for different sized dogs? Plz advise how much? My dog is medium sized but has a very long body and short legs. Ha! I can just see me on Dragon’s Den – not! Don’t mind putting an email address on here, so you can tell me what your up to using that if you want. And yes, would be great to meet up if possible! Wow, that is fantastic, a wonderful idea. I am very interested!! 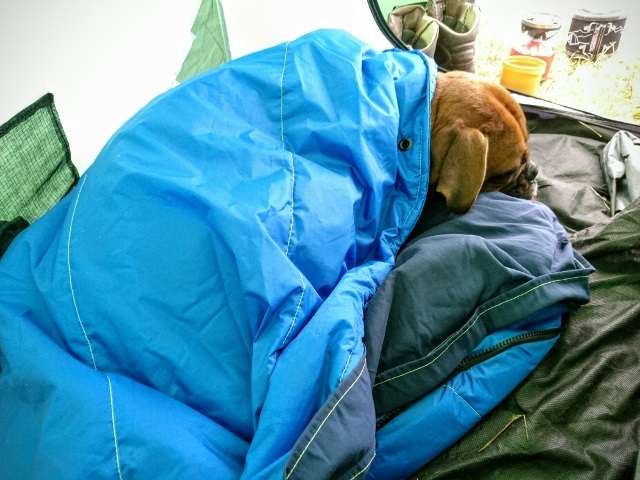 I’ve been meaning to investigate doggy sleeping bags for Merlin as I also have tried a number of things and he still always seems to end up cold (at which point I end up wrapped around him with as much of my sleeping bag (and clothes) on top of him! I’m on holidays at the moment but will try to email you when I get back. 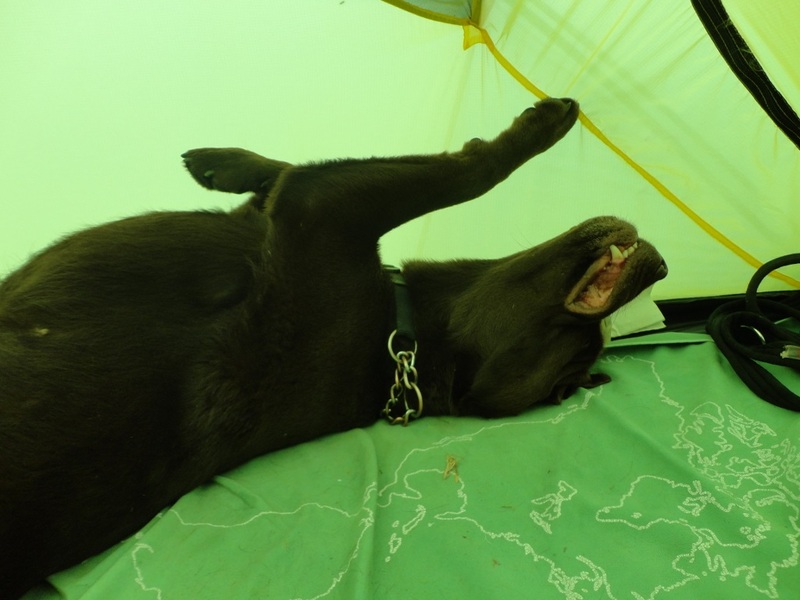 Hi Christine, there’s a wild camping page on FB that will probably be interested in your doggy bags. Do you mind if I post a link to your site? Hi Cid, don’t mind at all, that would be great, thanks!